An invitation to research ancient menhirs sends you to Brittany to find these magnificent standing stones. But you quickly discover there is far more at stake than groundbreaking research. There is a prophecy. One that foretells chaos and evil being unleashed upon the world on the night when a comet hides behind the moon and turns the sky purple. Can you race against the clock to not only save yourself but the fate of two worlds? Options include separate sliders for Music and Sound, and three Difficulties to choose from - Casual, Advanced or Expert. For those who don't know, a 'FROG' is a FRagmented Object Game. The artwork in the game is beautiful, and I love that it's not the same exact color palette all the way through. That is the key to the success of this game, I think - the amazing variety the devs gave us, but without anything ever seeming out-of-place within the world they've created. In addition to having lovely graphics, the scenes all have an interesting perspective to them. The usage of different angles really added interest, and kept things from feeling bland. The character designs were a bit odd-looking at times, but that's insignificant compared to the rest of the game. There is nothing "standard" about the hidden objects, as even the find-by-list scenes are highly-interactive. In addition, we will be tasked with finding items by silhouette (finding an item will help you find another item, and so forth), Fragmented objects (find all of the pieces, and end up with a useable item - purple items are either in a zoom-in or you have to complete a task before you can find them). HINTS are refillable, and do not discharge when used to figure out which direction to go. There are a lot of locations spread across several maps, and there will be a fair amount of backtracking, but the flow of the game is so good that it never felt annoying or repetitive. The adventure, puzzles and variety of hidden object scene-types kept the game feeling fresh and fun throughout! The puzzles were all do-able for me, but none were insultingly-easy. It took me quite a while to finish a few of them! The story is nothing groundbreaking, but I enjoyed it nonetheless... Especially when it didn't end where and how I thought it would! 70 mistletoe sprigs, which can be found anywhere and everywhere, including the hidden object scenes! In addition to being an added challenge, these sprigs will also refill your hint-meter if it's low. There can be up to three sprigs on a scene, so look carefully! There are 19 Achievements to be had (both in-game and on Steam). Although some are acquired via regular gameplay, you're going to have to work for the others! This game is of the highest quality, from the sights and sounds to an interesting story line to fun gameplay. 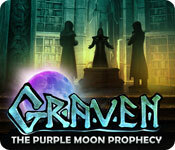 Graven: The Purple Moon Prophecy is absolutely one of the best-of-the-best in IHOG-adventures, and the price point (at Steam) of $3.99 makes it an absolutely steal! HIGHLY recommended!